Sonic Ironstorm: Fatal Attack is an updated version of DHC's earlier 3Punge competition entry. Hold the Z key to shoot, and press the X key to launch a missile. The secondary weapon can be used repeatedly without any penalties. Collectibles marked S increases your shield count, while acquiring items marked P upgrades your firepower in small increments. 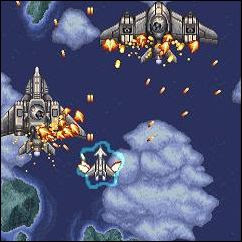 There are six stages to explore, though one is marked as a secret and players are only allowed to take on a maximum of three missions in each game.